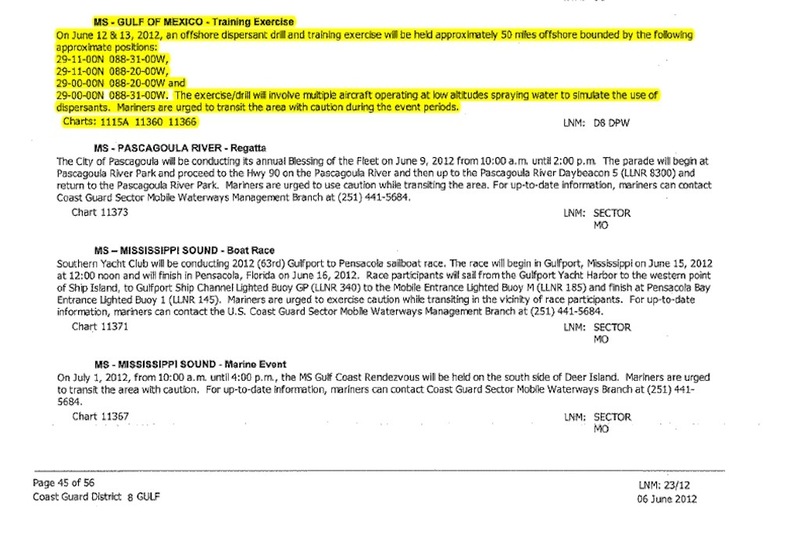 Here is the official summary of the U.S. Coast Guard's investigation into inquiries about foam seen in the waters off Venice, LA following a planned dispersant spraying exercise by MSRC (Marine Spill Response Corportation) out of Kiln, MS at Stennis Airport (KHSA). 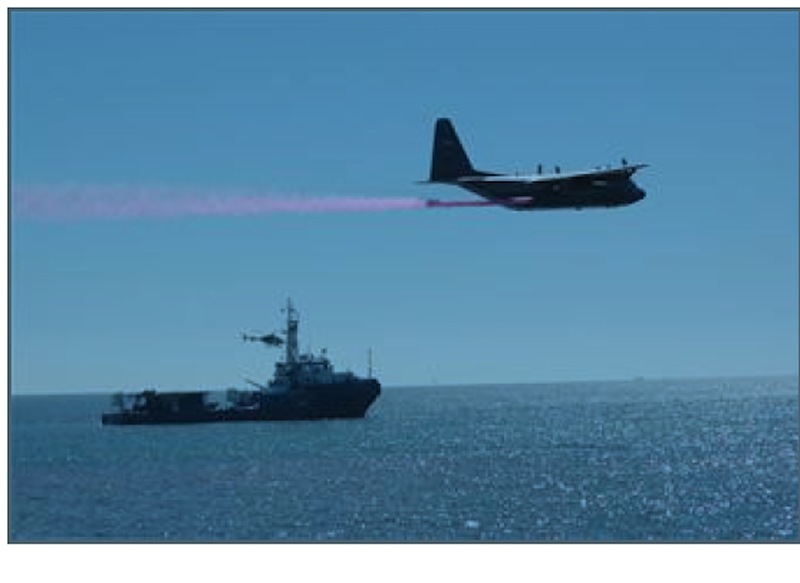 MSRC planned and claims to have used water as a mock dispersant for this exercise, scheduled for and carried out on June 13, 2012. 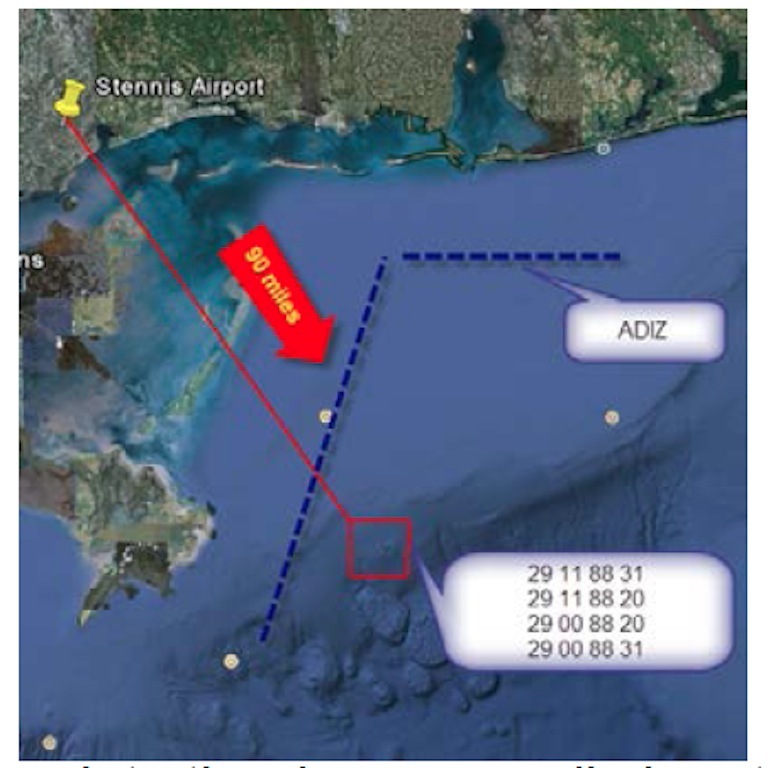 The original plan submitted by MSRC to the USCG can be downloaded as a pdf file here, under this website's main menu item "Flight Tracks" and titled "20120613-USCG Investigation of MSRC Dispersant Spraying Exercise." The public was also notified of this planned exercise by a Local Notice to Mariners, a photo of which is included in the gallery below this official summary. The other photos in this gallery come from the original plan available here for download. This flight was made possible with financial support from Flightlinefirst.com. Thank You for helping On Wings Of Care protect the Gulf! Today we investigated a reported rig fire at an Energy XXI platform just 20 miles south of Louisiana, as well as the site of chronic pipeline leakage from a Taylor Energy platform damaged by Hurricane Ivan in 2004, and several other reported and newly-found oil slicks east of Venice, LA. Conclusions from today's flight are given below. "... SMOKE AND FLAMES ABOARD AN OFFSHORE OIL PLATFORM IN THE GULF OF MEXICO * PLATFORM SOUTH PASS 93B, OIL AND NATURAL GAS PLATFORM FOR ENERGY 21 HAS BEEN EVACUATED AND SHUT IN * ONE OF THE 100 BARREL TANKS IS ON FIRE WITH APPROX 20 BARRELS OF PRODUCT IN IT * PRODUCT IS A MIXTURE OF TOLUENE, XYLENE, AND DIESEL * ONE FIRE FIGHTING VESSEL IS ON SCENE WITH MORE VESSELS EN ROUTE * A CG CASA HAS BEEN DIVERTED ALONG WITH SMALL BOAT FROM CG STATION VENICE * THERE IS A POSSIBILITY OF FIRE SPREADING, BUT FIRE HAS NOT SPREAD YET." By Wednesday morning, there were few reports being carried by mainstream media (see, e.g., this media report) and minimal additional information about the cause of the fire or the extent of any pollution incident. Since there were also several other NRC pollution incidents reported within the past three days in close proximity to the Louisiana delta from southwest to southeast and east of it, we were interested in flying out to check out all of them. On receiving promises of contributions to help cover the costs of a flight, we loaded the coordinates of all of those recent pollution reports into our GPS, and off we went. In April 2012, a large collaboration of scientists including many from Gulf Coast states of Mississippi, Alabama, Georgia, and Florida began a long-planned voyage to carry out in situ studies of the state of the ocean floor in several strategic areas of the Gulf of Mexico. 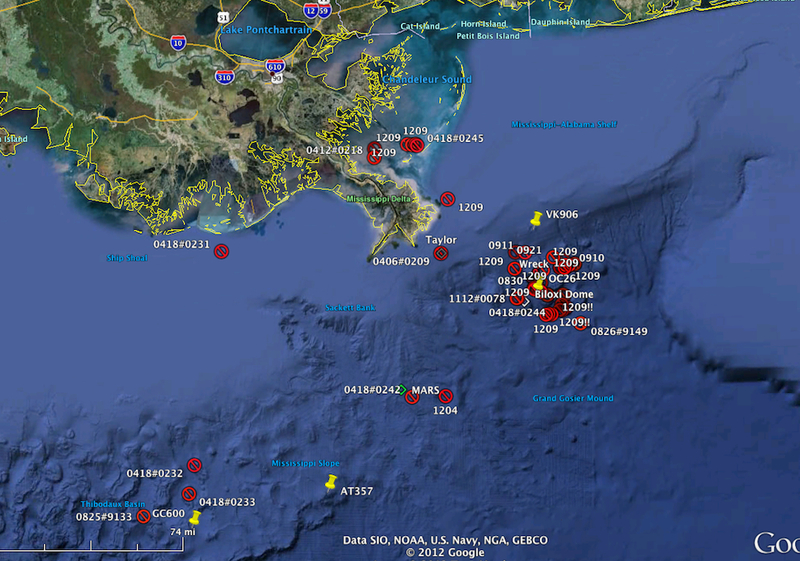 All of these are places of known natural gas and oil seeps within 200 miles of the Macondo area -- site of the massive Deepwater Horizon semi-submersible Mobile Offshore Drilling Unit (rig) fire and subsequent oil pollution disaster of April 2010. 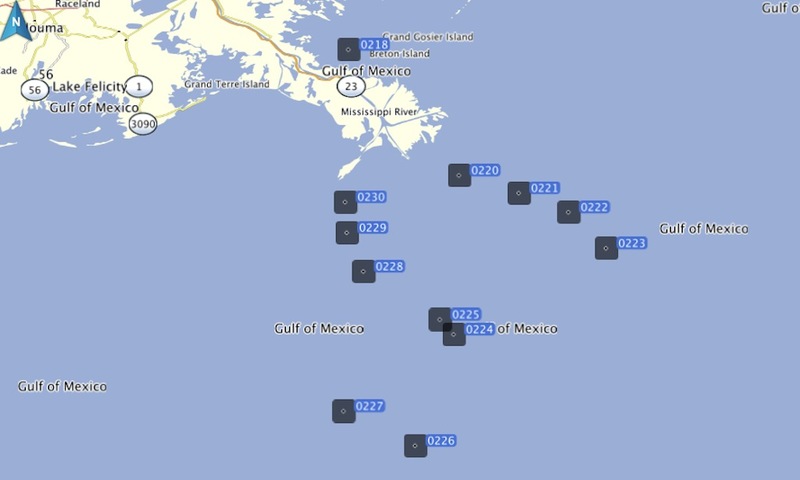 Maps of these places together with recent significant sightings of surface oil are shown below. 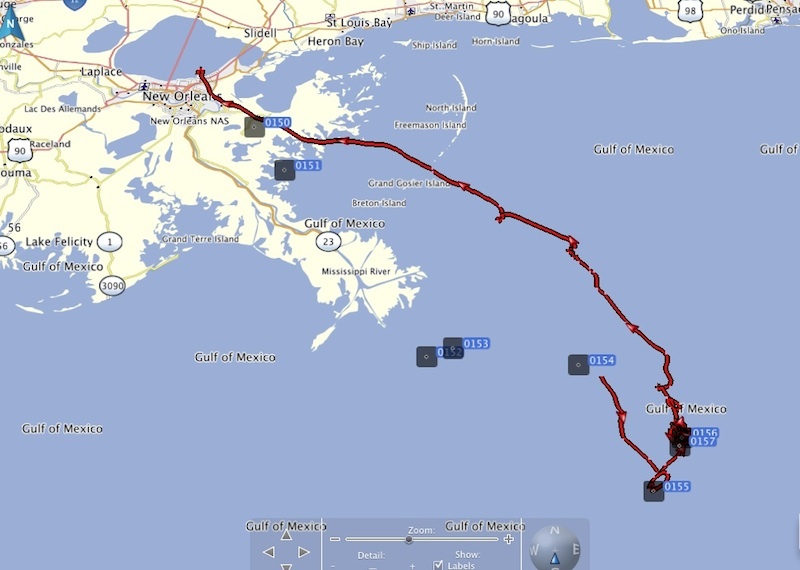 A large (approximately 60 m) vessel called R/V Endeavor operated by the University of Rhode Island set sea from Gulfport, Mississippi April 12 to study these seeps and the "state of the seabed." Another larger vessel, the NOAA Okeanos Explorer, has also been in the Gulf during April; they have been studying seeps in the Biloxi Dome area, 8-10 miles west of the Macondo well. (Photos of both vessels with discussion can be found in the article about our Gulf flyover April 18.) This article will report on the day-to-day adventures of the ship Endeavor, which left Gulfport April 12 and returned April 24. Scientists supporting the Endeavor include Gulf coast "local heroes" Drs. Samantha (Mandy) Joye, Ian MacDonald, and Vernon Asper, among others. Vernon served as chief scientist on Endeavor, and it is largely thanks to his regular reports that this chronicle is now available to the public. While the mission was an amazing success in many ways, it also fell short of expectations. This was due largely to adverse weather conditions throughout most of the two-week voyage and partly to a malfunctioning of the remotely-operated vehicle (ROV). However, because there was such a wide variety of instruments and an extremely resourceful and determined crew of scientists onboard, not a minute was wasted. Schedules were altered and other instruments were given priority. One of the most fascinating features you will note about this "reality" chronicle is the fast pace at which circumstances changed, and how flexible and clever the scientists had to be on almost an hourly basis. This is experimental science in the real world! It is no game for the uninitiated or the easily discouraged, for even the best-laid plans inevitably require back-up plans. This month On Wings Of Care has been supporting a large group of scientists who are carrying out a long-planned mission to study the state of the ocean floor in strategic areas of the Gulf of Mexico. 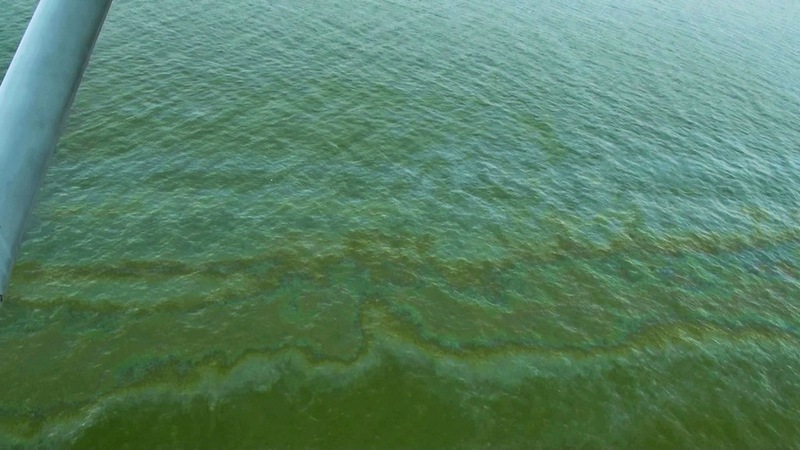 These include places of known natural gas and oil seeps, as well as areas where persistent and significant surface oil slicks have been observed since the BP oil pollution disaster of 2010. Today, OWOC flew out to an area in Green Canyon, far offshore in the deep blue water about 180 nm south of New Orleans and 160 nm southwest of the infamous Macondo well, to meet scientists aboard the NOAA ship Endeavor. We saw a fair amount of oil, some in expected places and some not. We saw no wildlife except a few sea birds near ships. Not a fin, not a spout, not a shadow. Not a dolphin, whale, sea turtle, shark, ray, or tuna. We're hoping that it's because we arrived too soon after the storms, or perhaps the weather patterns have contrived to change these animals' travel patterns, and we'll see them in these areas later in the year, the way we've seen them here in years past. But a flight over the Gulf without seeing wildlife is rare for us, and a disappointment. Today was supposed to be a simple reconnaissance mission and practice flight with scientist colleague Dr. Ian MacDonald from Florida State University in Tallahassee and some new photographic equipment we're going to be using in our aircraft. But its routine nature changed when word spread last night of a significant new oil slick in an area about 70 miles due south of the tip of the "crow's foot" of Louisiana, between the Mars and Ursa oil production platforms. Shell Corporation announced that they were sending oil spill cleanup crews and equipment to the site. Dread and despair was the response of many including our own. So that destination was added to our flight plan. And since that's probably what some of you are most eager to read about, we'll start our report with that one. The rest of the report will show the Taylor Energy slick (still! ), many smaller slicks encountered on our way northward back to the mainland, an ugly slick in Breton Sound (before we even made it out of the muddy Mississippi waters! ), and various vessels and platforms of interest in the Macondo area and elsewhere. Our original charter for today's flight was to test out techniques we plan to use in the near future for coordinating our aerial spotting with scientists on vessels who will be using ROVs (remotely operated submersibles) to study the condition of the seabed in some areas of the Gulf known to exhibit significant natural oil seepage. One of those areas is over the Biloxi salt dome, adjacent to and west of the Macondo area, where the Deepwater Horizon disastrous oil spill occurred just two years ago. Another is nearly 150 nm southwest of the Biloxi Dome, not far from the "Thunder Horse PDQ" semi-submersible oil platform in an area known as Thibodaux Basin, some 100 miles south of Terrebonne Bay, Louisiana. It just so happens that the Mars and Ursa platforms lie conveniently between those two areas! So not only did we get a good look at the "Shell oil slick," the scientists heading out there in vessels will soon have the opportunity to collect surface water-oil samples. Dr. MacDonald was surprised at the large amount of streamers and patties of stuff we saw, which we told him we thought was dead sargassum. We had to fly quite close to it before he began to believe that it could be sargassum and not very weathered crude oil, although frankly none of us is certain that these sorry-looking sargassum-like strings are a natural phenomenon. After witnessing his surprise, we wished we had urged people to take samples of this ubiquitous strange-looking vegetation a year ago, when we began documenting it all over this part of the Gulf. We have seen it regularly in a 40-nm radius around the Macondo area. Today's photos of it were taken between 10 and 20 nm to the northwest of the Macondo area; see gps waypoints 0221 and 0222 in the flight log below. After the flight, I showed him photos we had taken during the summer of 2010 of beautiful golden, healthy-looking sargassum about 150 nm to the west, in the Ewing Bank area where we had also found whale sharks. Mark this down for another important task for those with vessels who are willing to use them to come out and collect samples of these streamers and have them analyzed! There is so much to understand, and it still looks like it is up to citizens to gain this knowledge themselves. We are completely nonplussed as to why again today we saw absolutely no animals. No dolphins, no whales, no turtles, no bait balls, no flying fish, no birds even. Not a fin, not a spout, not a shadow. Where have all the wild ones gone? We hope they have found better waters in which to live, and may they live long and prosper there until this part of the Gulf is restored to health. Our flight log with GPS waypoints and explanations of sights seen is given as usual at the bottom of this article. Use it to know which areas or phenomena are correlated with which photos below. The oil slick between the Mars and Ursa oil platforms are between the waypoints numbered 0226 and 0227. The NOAA vessel Okeanos Explorer was studying the Biloxi Dome today at waypoint numbered 0223. The strange sargassum we photographed today was at waypoints numbered 0221 and 0222. The Taylor Energy slick was at waypoint number 0220. Several slicks on our way back to the mainland were seen, and by then we didn't even bother to photograph them all. (It's a terrible thing to become numb to pollution.) Some that we did photograph were associated with platforms in the vicinities of waypoints numbered 0229 and 0230. Waypoint number 0218, right next to Louisiana's eastern coastal wetlands, was one of those typical ugly linear slicks that is found regularly near oil platforms, this one about three-quarters of a mile long and 30 ft wide. Sample photos of these sites are given immediately below. Additional photos are provided in the gallery at the bottom of this article. It has been five weeks since we last flew over the Macondo area, scene of the worst oil pollution disaster in America just two years ago. There has been a lot of violent weather here in the meantime, especially recently. From a scientific perspective, it might have been better for us to have waited a few days before assessing things from the air, since it takes time and calm weather for oil seeping from the ocean floor 5000 feet below the surface to appear in a stable form that is easily seen from an airplane flying by at 100 miles per hour. But we decided to jump at our first available day of fairly calm seas, great visibility, and time that we all could take off from work. With cautious optimism based on this possibly premature aerial assessment, we were pleased to see very few of the surface oil slicks we've seen on every previous flight for the past nearly two years! Yes, there are still isolated lines and bands of sheen out in the Macondo area. Yes, there are still some activities at platforms in that area that we wonder about, such as significant discharging into the water of unknown substances. Yes, the chronic oil polluting Taylor Energy site just off the southern tip of Louisiana is still causing a seriously ugly and large slick. And yes, there are many more slicks off the southeast shores of Louisiana, not far from the Taylor Energy site and in almost every direction you look. Some are associated with platforms and some not, some short narrow lines and some more extensive in nature. No one seeing this part of the Gulf from the air could ever deny that the oil and gas industries have literally littered this marine ecosystem with navigational hazards, and pollutants, and eyesores. But -- starting about 15-20 miles off shore, we found blue water, some of it no longer visibly tainted with oil. And that was a relief. And while we'd like to stick with the optimistic tone, we must add one very puzzling and concerning fact. Today was our third day of searching for basking sharks off the coast of Florida, between Pensacola and Panama City. We were fairly certain we had seen one near shore last Thursday, and quite certain that we had seen some mako sharks. So when the fog finally lifted and gave us calm seas, we went out with high hopes. But today brought more questions than answers. Hundreds of dolphins were hanging out very near the beaches, relatively stationary around the second sandbar. Farther from people but still in the shallows were several schools of cobia and some large "bait balls" of small fish. Farther offshore but still within about five miles of shore, we saw manta rays and sea turtles (mostly leatherbacks). But nowhere today did we see a single shark of any size. The water visibility was good and we were flying "low and slow," so if they had been there, we would have spotted them. Unfortunately, the offshore fog was too dense for us to fly much more than about five miles offshore. Next weekend we'll search again, this time along a strategic route follows the ridge that surrounds DeSoto canyon, starting about 20 miles off shore. Scientists in Florida were very excited about some recent unusual sightings of large basking sharks near Panama City, Florida. Since we have been so successful at finding whale sharks for them the past two years, they asked us to fly over from New Orleans and try to find these basking sharks. Unlike another large plankton feeder, the whale shark, basking sharks are not a familiar site in the Gulf of Mexico, and little is known about them. Sharks are never easy to find from surface vessels, since they don't need to come to the surface to breathe. The best way to find them is from the air, when seas are calm and visibility in the air and through the water are good. A previous flight ten days prior by other people had found nothing. Just two days after our arrival back in the Gulf, we were eager to attempt the challenge. We hoped that previous failures had more to do with the weather conditions and limitations of the aircraft than with the presence of marine life in the area, but there was no way to know that for sure. We face every one of these challenging kinds of flights with the knowledge that we might give it our very best effort and still have no successful sightings. The flight eastward from New Orleans to Destin, Florida on Wednesday was delayed by weather until midday, and seas were choppy. I was more than a little concerned about our chances for success. But experience and determination are a powerful combination. And the spotters who joined me lacked nothing. Mike Sturdivant from Destin knows the local surf spots and the local marine life, and his skill with a camera matches his sharp eye and his enthusiasm. With Mike on Wednesday came a new spotter, Justin Wildhaber; and on Thursday, Mike brought John Cross. With all of our sharp and determined eyes, and some "low and slow" flying, we could at least say with certainty that if there were animals near enough to the surface to be seen, we would see them! 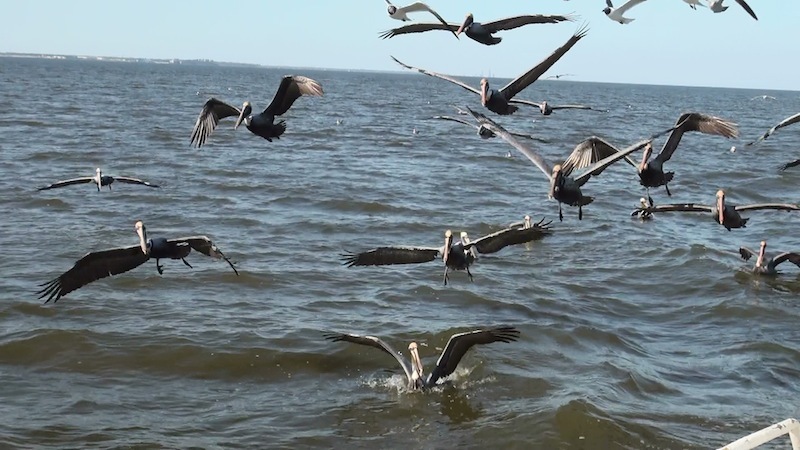 Last week, we heard from local fishermen near Mobile, Alabama about some very peculiar and unusual behavior by pelicans and other seabirds. They said that while the birds always like to follow their shrimp boats, lately the birds have become very aggressive and are literally storming the boats, the nets, and the decks, in their frantic efforts to eat the fish. We were told that "the birds are behaving as if they are starving and desperate for food, to the point that they seem to have little regard for danger to their own lives. They divebomb us, our work tables, the boat, the nets, everything." 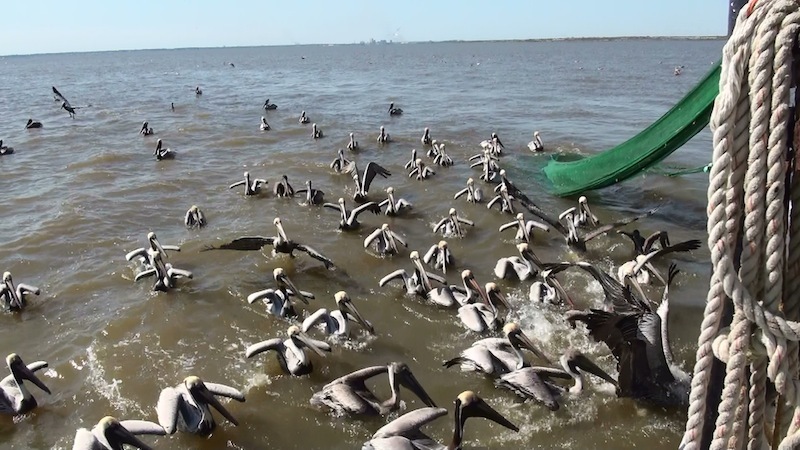 We also spoke with folks who run a seabird rescue center near Mobile, and they said that they've been receiving an enormous number of adolescent pelicans who are almost starved. Apparently they are unable to catch enough fish for themselves, although other than being undernourished they seem healthy enough. We contacted a few journalists and invited them to join us out on the water with some of these fishermen to witness this for ourselves. We were treated to a very interesting day on the water with Captains Michael Paul Williams, Pete Zirlott, and Sidney Schwartz, coordinated by our friend Zack Carter. We did indeed see this behavior by the pelicans, gulls, and loons, although the captains told us that the birds were "better behaved" today -- perhaps because there were so many people on the boat all pointing cameras at them? These captains are third and fourth-generation fishermen here, and they all say they have never seen behavior like this. It is not unusual for fishing to be sparse in the winter, but the birds have never acted this desperate nor been this aggressive in trying to take fish from the boats. Another peculiar feature of today's boat trip was that we saw not a single dolphin. The fishermen were very surprised at this, as the norm for them is to have dolphins all around and crossing their track frequently. Our first flight over the Gulf since late December 2011, for over two months! It was great for us to see it again from the air. But all is not so great with it, unfortunately. Long before we reached the tip of Louisiana, we noticed that the overall amount of marshland seemed significantly less than had been here this time last year. We also saw quite a bit of marshland that was blackened, as if by fire. We had barely begun to discuss what else it could be other than fire, when we spotted not one but two marsh fires ahead of us! No sign of human presence anywhere near either of them. What causes these? Lightning, perhaps? It was sad to see, for the strong southwesterly winds were sure to burn all of that land northeastward until it reached water. Indeed, on our return four hours later, both fires were still raging strong. Barely 10 miles off the tip of Louisiana, the chronic oil leakage from Taylor Energy's Ocean Saratoga platform, sunk by Hurricane Ivan in 2004, continues in what looks to be full force. We followed an ugly, quarter-mile-wide line of fresh oily sheen that stretches from west to east for more than 10 miles. The buoy we photographed there in early December remains, but there was not a work vessel nor any other type of vessel anywhere in the vicinity. We proceeded to the Macondo prospect (vicinity of the Deepwater Horizon disaster of nearly two years ago). Since we have not flown the Gulf since late December, and we have seen no reports from other pilots flying this far offshore, we had no idea where to look for oil. So we decided to return to some of the places where we have been seeing appreciable amounts of surface sheen consistently since last summer. That proved a good strategy, as we found oil and surface sheen almost immediately. And plenty of it. Read more: 2012 Feb 29 - OWOC Gulf Flight - Taylor & Macondo - Fresh oil still!